On Friday 7th April some Year 5 and 6 children went to represent Scalford School at a basketball tournament, and we did very well. I would like to thank the family members for bringing along the children and for supporting us during the competition. Also a huge thank you for Miss Moore for arranging wonderful sports days for us to do. 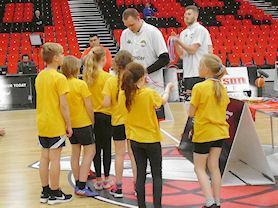 After we played we got to meet some of the players and watch Leicester Riders beat Sheffield Sharks. We all had an incredible day.